One of the more interesting sessions for Exchange aficionados to attend at the Ignite 2018 event is BRK3130 – Email Search in a Flash. It’s a 45-minute session at 4:30pm on Wednesday, September 26 that explains how Microsoft uses solid state disks to speed access to hot data, specifically the search indexes (the “big funnel” initiative) that now exist inside Exchange Online and Exchange 2019 mailboxes. The reason why this topic is interesting is that it marks the first time that Microsoft has embraced SSD technology for Exchange. Although this might seem that Microsoft is reversing course away from their decade-long campaign to concentrate on cheap JBOD disks for mailbox storage, this session will explain how Exchange 2019 and Exchange Online bring SSD and JBOD together to make the Information Store even faster. Obviously, this is an important point for Exchange administrators to understand as mailboxes swell larger and larger (and the search indexes become larger as a consequence). Remember, it’s not just email that Exchange stores in mailboxes these days. I can’t say too much more because of the constraints of the NDA I’ve signed with Microsoft. If you’re not at Ignite, you can catch the session via live streaming (all Ignite sessions are live streamed this year) or as a recording later. 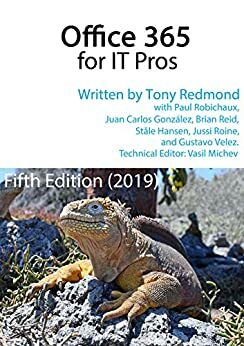 There’s tons more information about Exchange Online, mailboxes, and all that stuff in Office 365 for IT Pros, including the companion volume that you get with the main book.